I’ve been a little lax with the posting of late and I apologize. It’s been an uber-busy week. Terminal broke-ness resulted in me actually having to go and work this week…like, GASP…outside the farm. It was heinous and horrible, but necessary, I’m afraid. Good timing, though, with my wee man being out of town. Cleaning super funky rental units crawling with insect life that the tenants chose to not take with them for the move for your part time boss will distract you from anything else you’d be prone to put at the top of the whine list. Like missing your 8 year old, who’s off on a Dad visit. I joked with the boss this week I was going to fire his exterminator and put diapers on a tribe of my chickens and turn them loose in the next one to deal with the insect pets. I’ll call them the “cockroach containment unit”. Environmentally friendly. Chemical free. What’s not to love? Oh, yeah…free feed in the form of pestilence and disease with six legs. Ok, maybe NOT my million dollar idea. 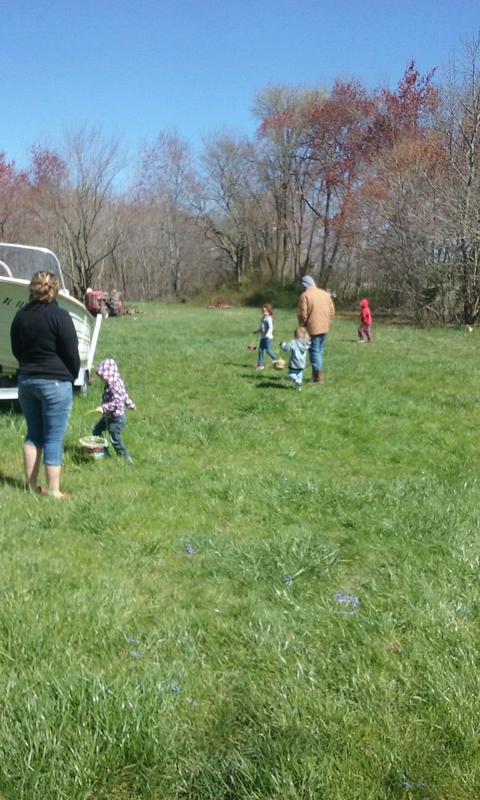 But Friday, all was once again right with the world, Ryan was back home, and my eldest and her hubby and brood of four girls were coming for the weekend. I have been covered up in glorious girly grandmuffin madness all weekend long. Sometimes I feel like since we didn’t go anywhere or take them to DO anything that I’ve failed at Me-mawing. But the weather was icky, it rained all day Saturday and today was a frigid windy mess. And I found out that as usual, I worry too much, because they mostly just had a blast. We had eggs hatching in the incubator and we wore a trench of a path from the back door to the incubator / brooder shed with flashlights checking on the progress of hatching peeps. Teagan, my eldest granddaughter, the self proclaimed “chicken mama”, spent a large portion of her weekend on egg collection duty and incubator watch. She takes these duties very seriously. 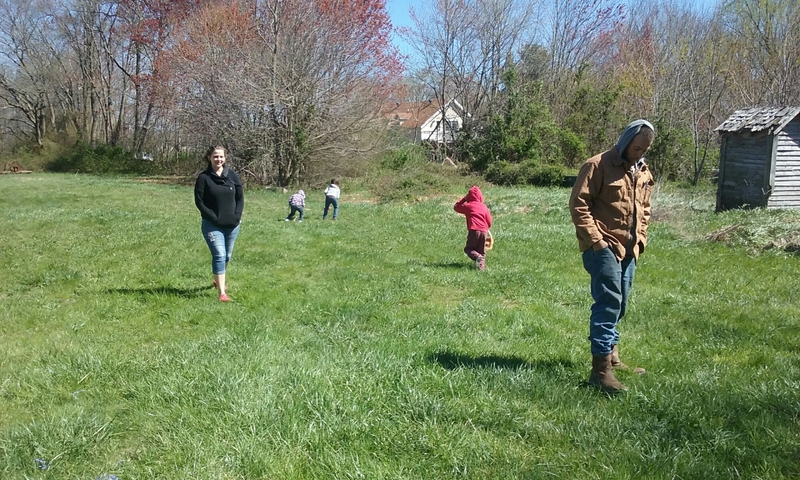 We had Easter Bunny tracks through the kitchen this morning, and a two acre egg hunt this afternoon. We’ll be running over the un-found eggs for months to come with the tractor. 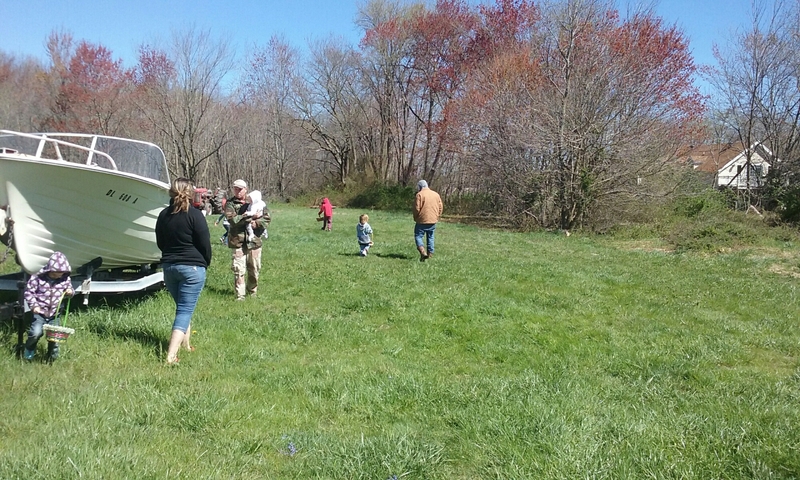 I occasionally refer to my grandgirls as feral children when they’re here. In the most loving way, of course. Mostly because they walk through the door with the confident assurance that they know exactly who is running the show from that point on, and it is no one over 4 foot tall. They have one of two speeds on this farm at all times. Full tilt boogie and comatose exhaustion. There is no happy medium. The shoes come off for the duration of their stay and the dirt begins accumulating on tiny faces. The back door never stops swinging and is rarely shut properly. There is very little that a pouty face and threatened tears won’t get you. Or get you out of. Or tiny arms slung around your neck, laden with motives because why should we not have candy before breakfast? The popsicle stash ebbs and flows in great waves. We eat what we please, we play till we crash from exhaustion, and then we get up and do it all over again. Bedtime? What’s bedtime? Pap and Memaws = anarchy. We have soup for breakfast and breakfast for dinner. There are toys in every square foot of the house and stray socks and blankies and stuffed animals, and we all love it. It’s completely unorganized chaos. It’s glorious. And thankfully, my daughter and her husband accept that. Or they’re just tired. Either way, I love them so much for allowing me to turn their kids into a tiny tribe of anarchists when they come through the door. I miss them already. 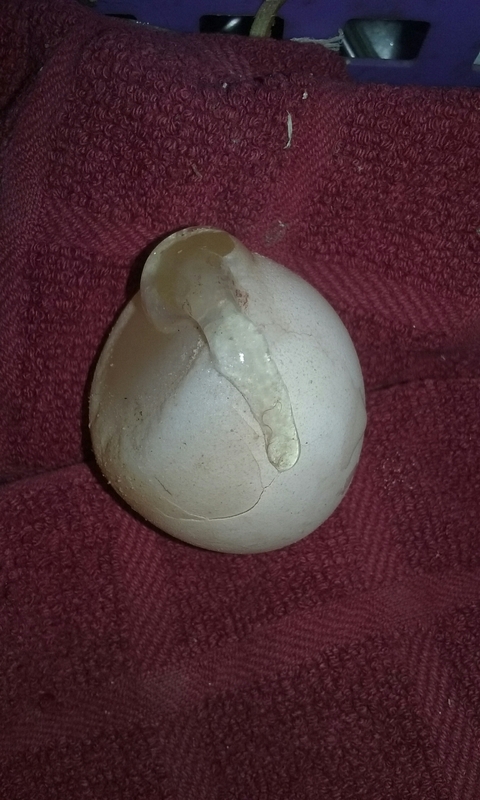 This morning, one of our Rhode Island girls laid a soft-shelled or “squishy” egg. This is a fairly common occurrence, especially in newly laying pullets, or can sometimes indicate a calcium deficiency in a hen. So I thought I would take a minute and cover egg issues for those who have yet to have the joy of reaching into a nest box and shrieking like a teenaged girl when your fingers touch something, well, gross. Squishy eggs: Often a new layer issue but can be indicative in an older hen of a calcium deficiency, or something lacking in the diet. Our particular completely squishy egg had no white, only yolk. No chance of hatch, and I’ve personally never attempted eating one for fear that bacteria could have made it through the membrane. The next day a second, half squishy egg was laid by likely the same hen. The portion of the shell that was complete was so thin you can see in the photo where my finger went through it, simply by picking it up. This one was all white. No yolk. Wrinkled eggs : These can happen when a growing pullet is just starting to lay, or if there’s been some upset or interruption during the egg forming process…the egg can come out with little ridges, usually only at one end. Perfectly safe to eat, and we’ve had them hatch in the incubator as well. 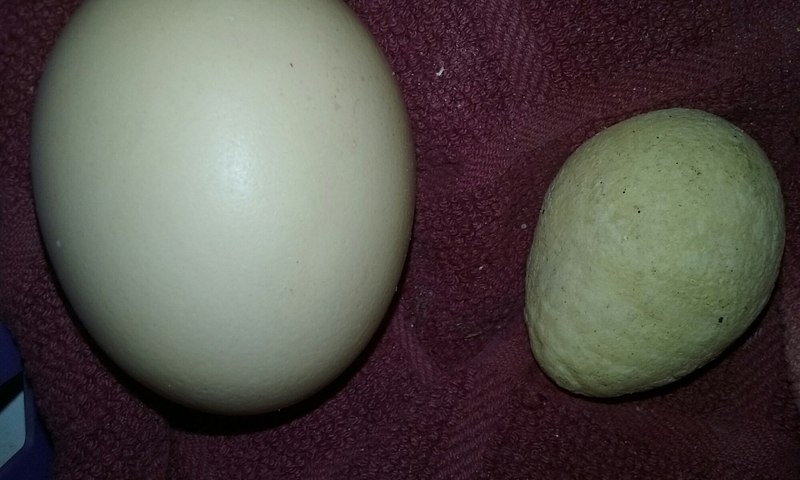 Under / oversized eggs: Under sized eggs can be from the size of a marble on up…again, usuall newly laying chickens, or sometimes an aging hen. They can be perfectly normal inside, all yolk and no albumen (white), or the reverse, no yolk with all albumen…these are sometimes referred to as wind eggs, fairy eggs or fart eggs. The over sized variety will often contain a double yolk, and very rarely, an egg inside another egg. You can safely consume all of the above, should you desire to. However, undersize eggs will almost never hatch, because they only contain albumen or yolk, rarely if ever both. Hatching double yolkers “twins” can be done, but is very rarely successful. Wind eggs: see above…an egg with no yolk. Never tried eating one, but they definitely will not hatch. Blood Spots: Little blood spot in your breakfast egg? No worries. Lots of people think this is the indicator of a fertilized egg. It’s not. It’s the result of a tiny rupture in a blood vessel in the oviduct of the hen during the formation of the egg. Scrape it off gently with a knife if it grosses you out, carry on with breakfast as usual. Lash Eggs: Ok, these are just gross and usually very bad news. Not for anyone with a weak stomach, you can read a fantastic article on them Here: Lash Eggs explained. If you find an egg shaped mass with layers of icky, squishy content, this is probably your suspect. Generally caused by a disease called salpingitis. Prognosis for a hen with this condition is poor at best. Ashy Eggs: These are eggs that are laid with a chalky or ashy appearance, like a film of sorts over the usual color of the egg. Not a big deal and I’ve both eaten and hatched them. There are all sorts of abnormalities that can occur during the formation of an egg during its travels through the oviduct of a hen. Most of them shouldn’t alarm you, but lash eggs or a hen that continually produces abnormal eggs should be cause for immediate quarantine or culling, and a vet consulted if the hen is a pet. Fun E Farm Create a free website or blog at WordPress.com.